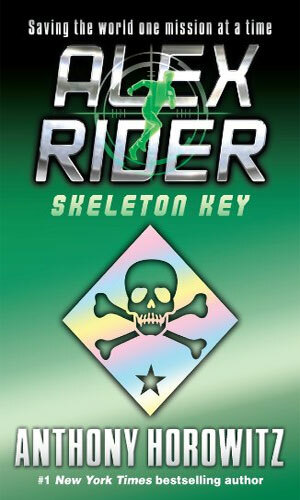 Alex Rider is an agent with MI6. He is also a 14-year old male who never expected, nor wanted, to become a spy and would likely have looked at you oddly if you had suggested it. Nevertheless, life, and the death of someone close to him, forced the issue and pushed the teenage boy into growing up far too fast. 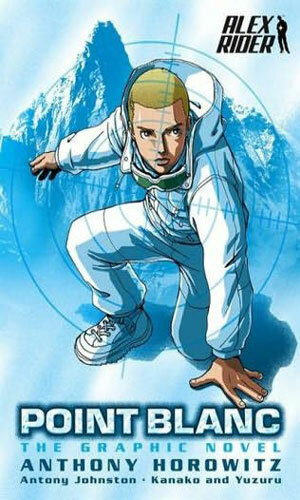 His parents, John and Helen Rider, died in a plane crash just a few months after Alex Rider was born. Though Rider would not learn of it for many years, his father had been a distinguished agent with MI6 for many years, codename Hunter, and it was that service that would cost the couple their lives. Infant Alex went to live with his uncle, Ian Rider, who became the only parent the youngster would know. Uncle Ian shared something with his brother - he, too, was an MI6 agent. Using a cover identity as the overseas financial manager for the Royal & General Bank, his trips around the globe on behalf of his employer gave him terrific camouflage for the clandestine work. When he was old enough to travel with his uncle, Alex Rider became a junior citizen of the world himself, learning what life was like in numerous parts of the globe. He also learned a wide assortment of skills from his uncle as they shared a love of adventure and outdoors activity. Hiking, camping, rock climbing, sailing, scuba diving, and more the two did in exotic lands and at home. He loved his life. He found he was particularly good with languages. He could grasp a culture and a way of speaking and feel totally at home with it quickly, a talent that made his times in different countries even more pleasurable and would aid him greatly when it came time for his work with British Intelligence. That arrived with the murder of his uncle. That man's death when Rider was 14 nearly shattered the boy but the resilience instilled in him came through and when the opportunity to fight back came, or more accurately forced its way in, Rider was ready. Well, mostly. As the series progresses, Rider, a student at the Brookland School in London, lives with his legal guardian, Jack Starbright (don't let the masculine name fool you), and takes the odd mission or two, when exams allow, for not only MI6 but also, less commonly, for the CIA. 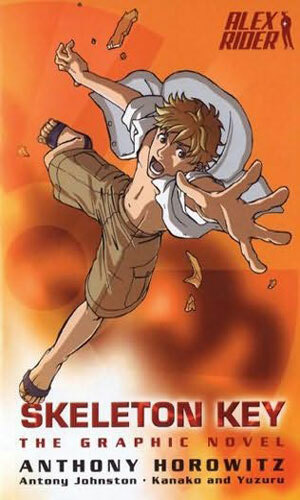 He gains insight into those who killed first his parents and then his uncle and he finds a way to exact justice. 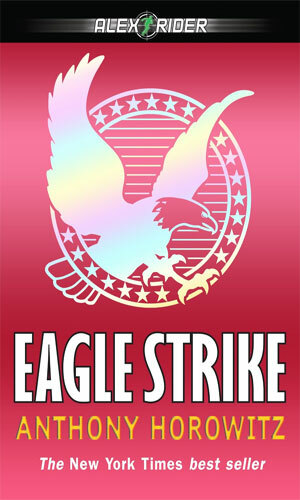 First published in The Funday Times taking place after Skeleton Key and before Eagle Strike. First published in The Daily Mail taking place before Stormbreaker by several months. 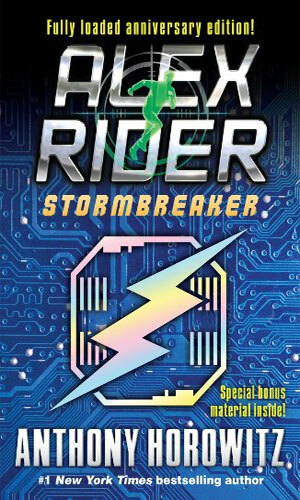 An extra chapter released for Stormbreaker. First published as a News of the World Reading Special. 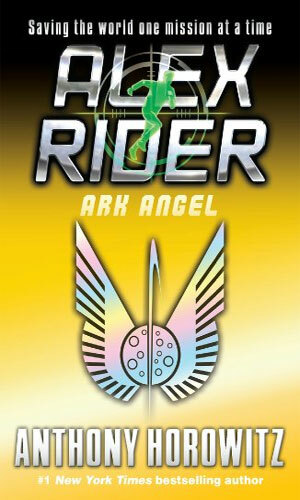 Takes place after Ark Angel and before Snakehead. First published in The Times taking place after Point Blank and before Skeleton Key. 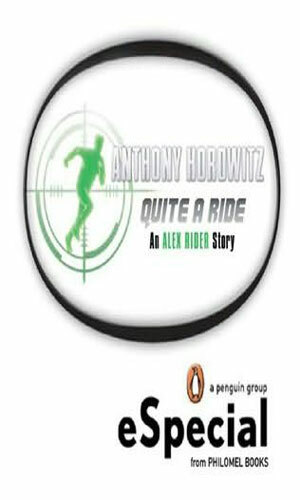 Wanting some R&R a while after becoming a spy, Alex Rider heads to the south of France where his vacation turns out to be a very nasty business. 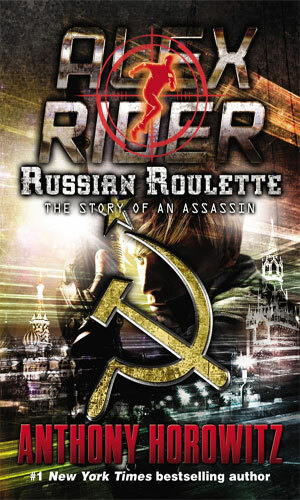 When his uncle is assassinated, Alex Rider is approached by British Intelligence to help get justice. He must go undercover to check out a possible virus at a factory in Cornwall. The title is the name of an academy in the French Alps where sons of the rich go. They are also being replaced by clones in a scheme of the director, a scientist with dreams of power by controlling the fakes. Alex Rider has earned the enmity of a Triad by stopping a plot to fix the Wimbledon tournament and now they are after his head. To stay alive, he is sent on a mission to Cuba where survival is hardly likely. 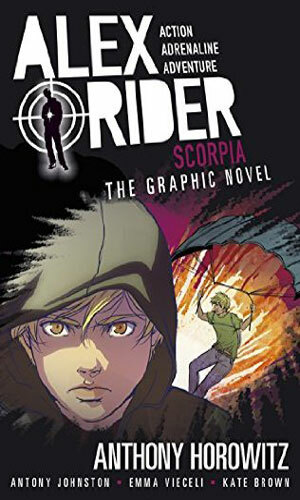 Only Alex Rider is taking a close look at Damian Cray, a famous pop-star who is branching into games with a new one that Rider is certain is dangerous. As MI6 ignores the problem, Rider goes it alone. 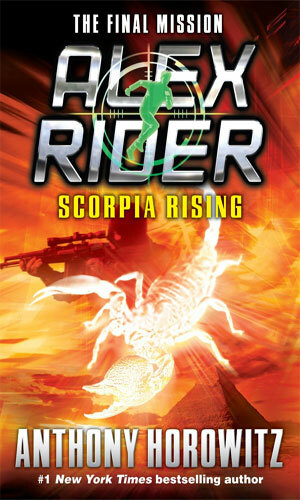 To learn more of what happened to his father, Alex Rider infiltrates the Scorpia organization but getting so close to such a dark group can only bring out the dark in oneself. 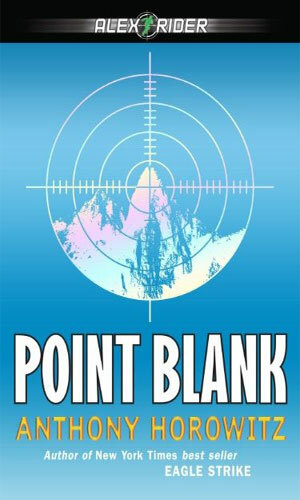 On a mission for the CIA, Alex Rider finds that wealthy Nikolei Drevin's plan to build a hotel in space is just a part of a deeper plan to destroy Washington, D.C. 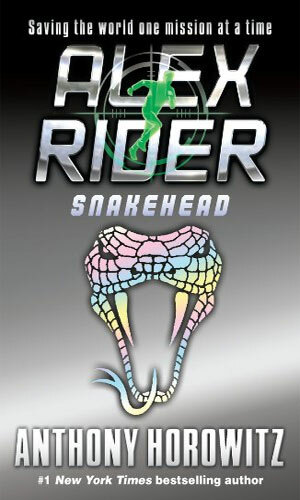 This go-around, Alex Rider is approached by the Australian Secret Service to infiltrate the Snakehead organization. 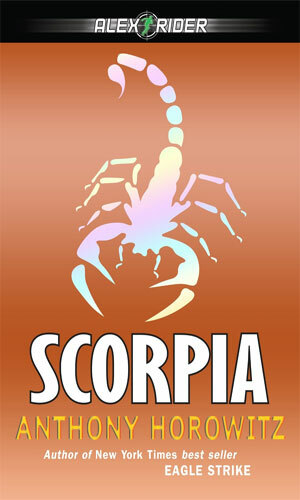 There he comes across yet again the Scorpia group. 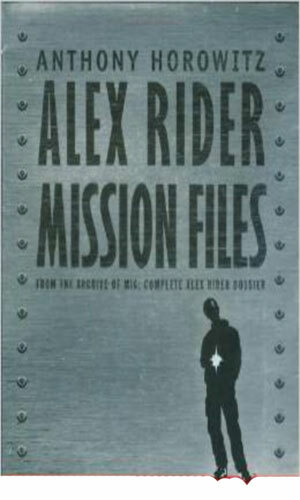 Alex Rider is again helping MI6 when the target of their investigation learns Rider is onto him. Captured, Rider is taken to Africa where he learns the evil his target is planning for that continent. 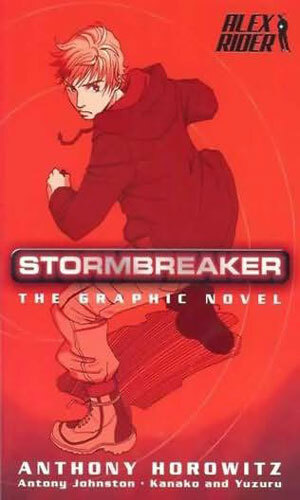 Scorpia has a new plan to increase their power and they have fooled MI6 into unknowingly help which means that Alex Rider, working for MI6, is really working for Scorpia. A prequel - His desire to bring to justice the assassin who caused him so much pain is given a chance to be fulfilled but that means learning that the killer had been personally trained by Alex Rider's own father years before. Coming in October 2017 - Alex Rider has moved to San Francisco where he is having difficulty dealing with the loss of his friend and mentor. Then a very short message makes him think his friend might be alive and in trouble so Rider goes on the search. Reeling from the death of his uncle who raised him, Alex Rider is forced by MI6 to get involved in a mission on which the lives of millions are depending. So far the first five Rider adventures have been turned into graphic novels. The plotlines remain totally true to the books though allowances are needed because of the limited space. More are said to be on the way. When his uncle is murdered in the line of duty, MI6 calls upon a young Alex Rider to step in and help on a vital mission. 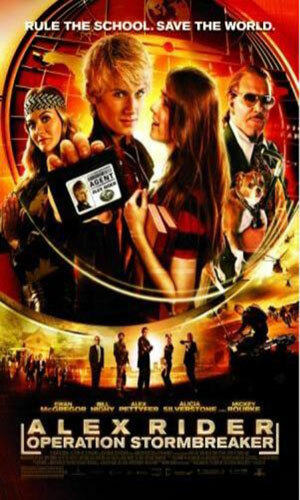 Sent to a Swiss boarding school on a mission, Alex Rider must find out the truth about the headmaster and what is really happening in the remote location. 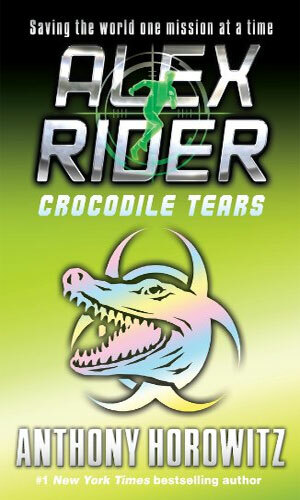 It is no vacation for Alex Rider as he heads to Cuba to check up on a rogue KGB agent. 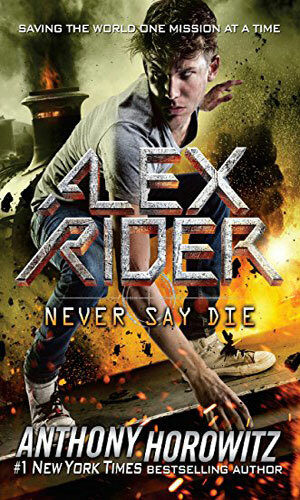 Just as he was starting to think of himself as a normal teenager, his friends are attacked and Alex Rider is determined to find out why, even if MI6 does not seem interested. 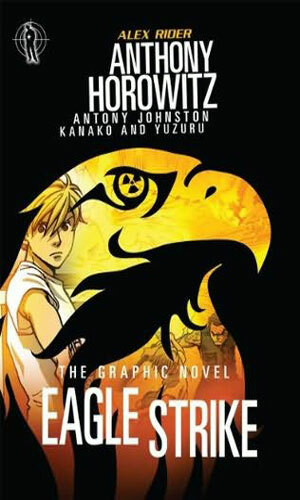 Graphic novel version of the book with Alex Rider heading to Venice to learn more about his past and getting tangled up in a plot by the criminal organization Scorpia. 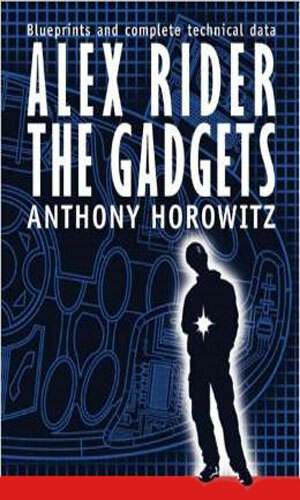 A look into the world of Alex Rider and his terrific set of toys. A deeper look into what brought about some of the earlier missions Alex Rider got involved in, and the players who caused them. Oh, when I was a teenage reader, how I would have totally devoured this series. I would be haunting the bookstore constantly for the next year's release. I would have read and reread and read yet again the terrific adventures, studied the comic books like they were Classics Illustrated, and then started it all over again. Of course, I am nowhere near being a teenager anymore (thankfully) but I can still enjoy well written books with terrific timing and plotting and characters that you really get to like - or dislike - and mean it. The author takes the young man at a moment's notice and pulls him out of his "normal" life and suddenly the lad is dangling from a wire or on a speedboat or high in the air and lots of people are trying to end that life for good. I strongly recommend this series to anyone who likes good yarns and great adventure, whether the reader be young or, like me, not so young, and whether they be male or female. The movie is really a good job, just as the books are, and the comics are a lot of fun, but it is the books that is the star attraction.